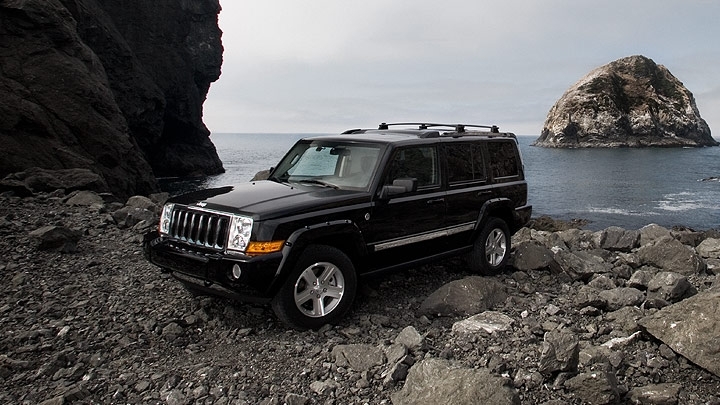 It’s been a while since the Jeep Commander first appeared back in 2006, and the automotive landscape has changed considerably since. A hefty, Hemi-powered (optional), seven-passenger SUV, the Commander laughs in the face of tiny crossovers and fuel-sipping clean diesels and hybrids. Because, even though it’s just four years old, the Commander feels decidedly old school. In true SUV guise, both V-6 and V-8 engines are on offer – though as only one mpg separate them, we advise going ahead and springing for the V-8 – as is rear- or four-wheel drive. And inside, the Commander feels very functional, though perhaps not in the best way, with copious hard plastics and funky ergonomics. With its boxy styling and third-row seating, you might look at it as a cut-rate Mercedes GL, but unfortunately, you’d be wrong. It’s made to be a rugged all-rounder, but with docile on-road dynamics it feels equally – or perhaps more – at home cruising on the freeway. The three moonroofs still look cool and help open up the interior of the vehicle, a touch that has been copied by other vehicles such as the Ford Flex. Optional towing add-ons will make life easier for those who need to haul both equipment and the entire family. The Commander feels like a bit of a blunt object, both on the road and off. Control feel and drivetrain feedback is minimal, and the interior is filled with hard plastics and angular trim. If you’re the kind of person who likes to keep things simple and functional, that may work for you, but if you have a creative side, it may prove too bland. For a large, rugged SUV, the Commander’s suspension is surprisingly soft and forgiving, which we like as most are likely to use it around town rather than out on the Rubicon. The steering, however, is devoid of feel, and the drivetrain is so well damped that you won’t know the car has downshifted if you can’t hear the engine revving, which leaves you feeling very disconnected from the driving experience. The Commander feels perfectly at home just cruising on the freeway, but the problem lies in the fact that so do many smaller, more economical vehicles. T he Commander is powered by a 3.7-liter V-6 that produces 210 horsepower and 235 lb-ft of torque. Also available on the Limited trim is a 5.7-liter Hemi V-8 engine that produces 357 horsepower and 389 lb-ft of torque. Power is driven either to the rear or all four wheels via a five-speed automatic transmission. If you’re taking both people and cargo along for a journey, the Commander will accommodate just about any circumstance, with 15 different seating positions. Rear seat air conditioning will keep everyone comfortable, while Jeep’s available triple sunroof will ensure everyone gets plenty of natural light. Jeep’s optional uConnect system (also seen in many Chrysler models) adds a digital screen to the dash that manages everything from Sirius Satellite Radio and sound system settings to the navigation system. Mobile TV and Internet are even available, so you can turn your Commander into a mobile WiFi hotspot. No one is buying a Commander for its green credentials, but interestingly enough, there really isn’t much advantage to buying the V-6 over the V-8, other than the lower price. The two-wheel drive V-6 returns 15 mpg city and 20 mpg highway, while opting for four-wheel drive will see those figures drop by one mpg each. Interestingly enough, the V-8 isn’t far behind, at 14 mpg city, 20 mpg highway. Again, those figures fall by one mpg when it’s equipped with four-wheel drive. Inside, the Commander feels utility-focused, though that’s not to say that it’s uncomfortable. Both cloth and leather seating surfaces are available in a variety of colors with associated trim options, and the massive variety of seating configurations means there’s an option for just about any scenario. The front of the Commander is dominated by Jeep’s signature slotted grille, while the slightly raked windshield contributes to the Commander’s undeniably boxy shape, which continues rearward. 17-inch wheels come standard, as do fog lamps. The Commander Sport 4x4 comes in at an MSRP of $34,355, while the more luxurious Limited model begins at $40,990. Competition includes the $32,480 Toyota Highlander SE, $37,280 Chevrolet Tahoe, $32,495 Honda Pilot 4WD EX, $35,585 Ford Expedition and $32,890 Nissan Pathfinder. 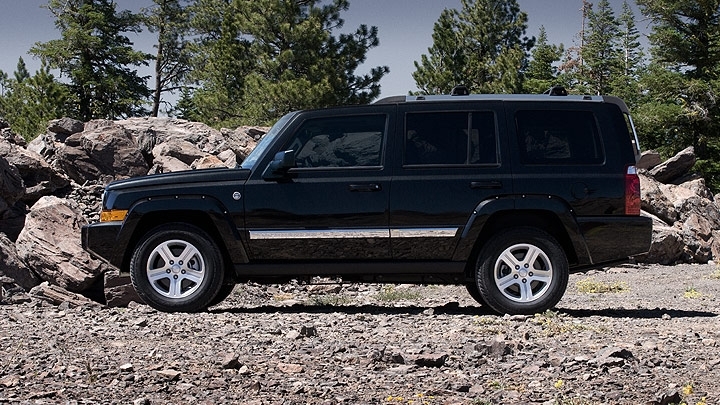 The Jeep Commander is a competent vehicle and you certainly can’t argue with the pricing, but it might prove a bit too old school for some. Seven-seat Crossovers such as the Chevrolet Traverse and Ford Flex are becoming ever more popular today thanks to their plush around town ride and improved fuel economy over traditional SUVs. 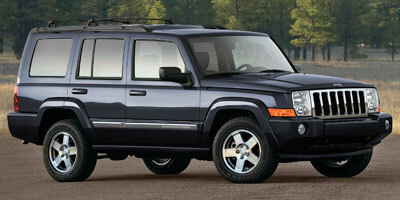 It’s not that the Jeep Commander is a bad vehicle; it’s just that the market has changed a lot since 2006.